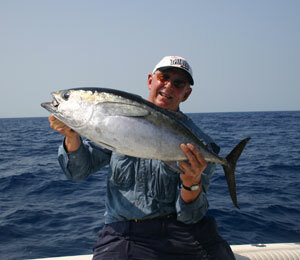 As far as fun goes, the Wahoo is one of the most enjoyable, sought-after fish in the Bahamas. Almost as fun to pronounce as it is to catch, this fish is a lightning-fast speed demon determined to evade your lure. As you prepare to fish Bahamas and Nassau waters, be ready to chase after this highly-evolved predator – and celebrate once you finally make the catch! This species is a slim, long fish designed to travel at record-breaking speeds underwater. Capable of reading up to 50 mph, it is one fish that professional and amateur fishermen alike hope to hook – though the feat often proves difficult for even the most experienced fishermen. This particular species can grow up to eight feet long and weigh over 100 pounds. Its coloring is an iridescent blue with stripes along the side. A true oceanic beauty, this fish resembles certain breeds of Mackerel. You will be able to discern the Mackerel from this fish, however, after evaluating its large tail which resembles a sharp, pointy blade. Once you see this distinguishing feature, be ready: it will be a wild ride! 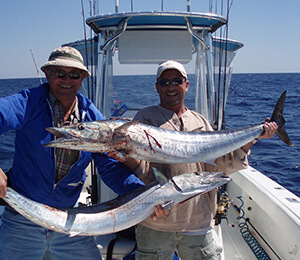 It is not uncommon for a hooked Wahoo to go off on a long run – making catching this fish a true trophy for any avid fisherman. You will find this fish in tropical climates and catching this breed is often a surprise for many who are out for a leisurely Bahamas fishing trip. Once thought to feed sporadically on its own and without a discernable pattern, this fish is now known to feed in groups, resulting in large catches off the Southern coasts of Florida. Unlike many other species, a small chop or 20 knot-per-hour winds will not make a difference in the feeding pattern of this fish. This fish has extremely well-developed eyesight and prefers to lunge upon prey in an unexpected, surprising manner. In terms of its tastes, it prefers squid and various baitfish. Most reported catches of this elusive fish have occurred either near wreckage sites in the Gulf of Mexico or within the Atlantic Ocean. Many with experience in catching this breed have compared the pursuit to that of a Yellow Fin Tuna or Marlin – a truly exhilarating experience you won’t soon forget! To catch this fish, Bahamas fishing experts recommend starting early in the morning. 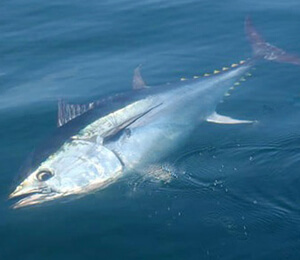 Experienced fishermen report the most success in reeling this breed right around daybreak. It is also helpful to turn off your engine and let the fish come to you. This fish, while often feeding in groups, tends to team up with several other types of fish prone to tropical waters, which is why many who fish Bahamas are surprised to reel in this fish when it happens. The Hawaiian word for this fish is “Ono” which means “tasty.” If you are lucky enough to make this catch, serving Ono filets to your guests is sure to be a real crowd pleaser!